The language ID is a word integer value made up of a primary language and its sublanguage which is defined by Windows. If the resource item is "language neutral" then this value is zero. 1. Select the resource item and click the 'Change Language...' button from the button bar as illustrated below. 2. 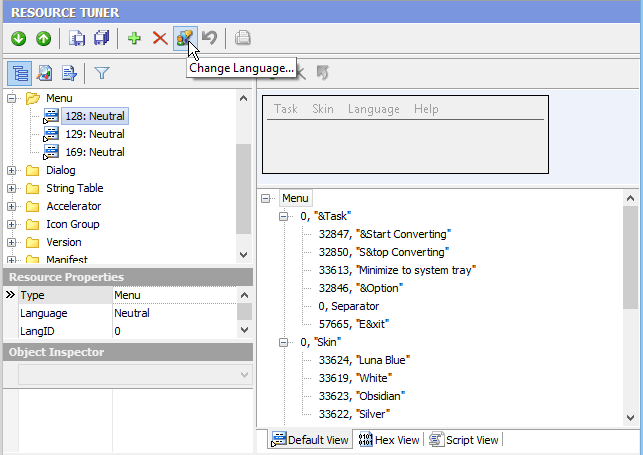 Select the new language in the list and choose how to apply it. 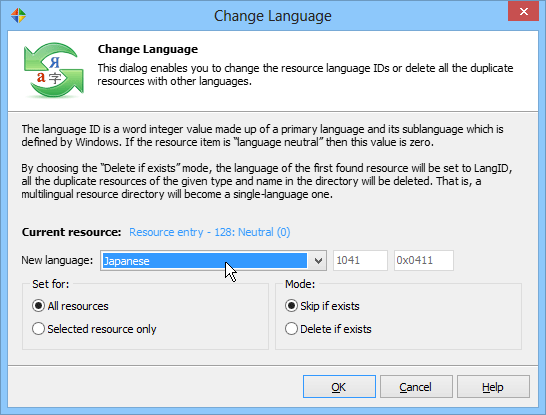 By choosing the "Delete if exists" mode, the language of the first occurrence of a resource will be set to LangID, all the duplicate resources of the given type and name in the directory will be deleted. That is, a multilingual resource directory will become a single-language one. 3. Click OK and select 'File' -> 'Save File' to save the altered file to disk.